If you're in the West Hollywood area, I highly recommend you stop by Früute, this phenomenal new mini tart bakery. They have such unexpectedly-paired flavors and are almost too beautiful to eat. The center one below (topped with the world's tiniest macaron!) is one of my favorites. Perfect timing when so many of us have grown tired of the cupcake fad. I'd much rather pay the same amount of money for one of these artfully arranged tarts with quality organic ingredients than a big blob of icing. Artisanal pastries are where it's at people. Get with it! Ugh, I'm totally beginning to think that I should be looking west, not northeast for the next big move. I hate cupcakes because I always feel like I can make them at home. Is that too arrogant of me? My mouth is watering! These look amazing, definitely beat a cupcake. Ah! I'm such a sucker for anything miniature - these look so beautiful. 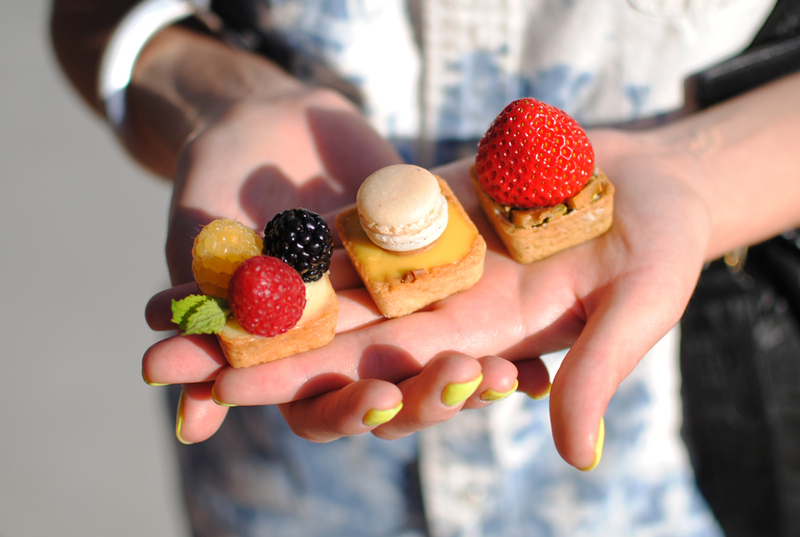 The tiny macaron looks adorable!!! Holy tart mother of god! Those look delicious and way too cute! omgzzzz i wanna eat them all. actually i want to stare at them all day. TOO.CUTE. They look so yummy! Looks too cute to taste! For about a minute... Yummm. I have a serious sweet tooth, so I will be checking this out for sure. Love these photos and I love this spot. I still have lots of nice shots from the opening that I've got backlogged and need to post. I cannot wait to go back to Fruute! wahhh these looks AMAZING! I would roadtrip to cali from arizona JUST for these!